I'm finally back online after moving from the beloved Delma Island to Abu Dhabi City. It was more than a hassle to get the things off the island but I'm finally settled some. The most challenging part was getting the internet turned on because the company here makes Comcast seem highly organized and efficient; not. After that ordeal, I'll gladly call the oh so competent representatives of the low functioning Comcast. In other Abu Dhabi News, it's hot. OMG, it's super hot. Today, it was 117 at 11:50 AM. As I drove through the city my feet were on fire. Let's say that Old Navy Flip Flops + Abu Dhabi heat = feet on fire. Meatless Monday had meat. It was my intension to make cauliflower hash with red onions but our Iftar plans turned into a great meal at home. 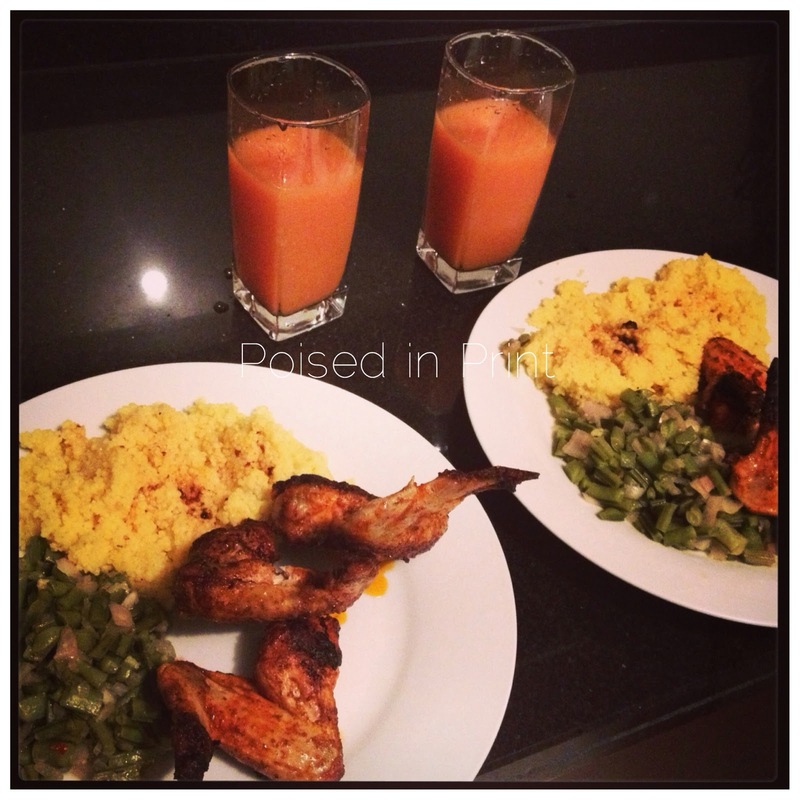 We had Tandoori Chicken, couscous, and green beans with a mango strawberry smoothie to break our fast. It was Ash's first time having couscous and he loved it. I loved that I only had to make the couscous and rested my apron for the evening. Like many, I am outraged by the verdict of the Trayvon Martin case. There is absolutely no reason that George Zimmerman should be a free man. I encourage all residents to know the laws of your respective jurisdictions. Understand the wording and be abreast of elected officials. This trial was about prosecuting a defenseless dead teenager who wanted nothing but to visit with his dad. George Zimmerman not only provoked the altercation but escalated by introducing a weapon. The unnerving issue is that the clearly racist jurors seemed to have decided the case prior to hearing the evidence. The State of Florida failed Trayvon Martin. May karma due its diligence for all parties involved. I read a thought provoking article by Jai Stone of Essence.com about relationships among women. She outlined types of women who should be avoided and boy do I have a reaction and addition to her list. My time in Abu Dhabi has definitely highlighted a few things about women that are in desperate need of repair. Finding a new web designer has proven to be harder than I thought. Some of you so called small business people need Small Business 101 and Business Etiquette 102. Stop guessing as to why your business is trudging along because the fault lies with you. Answering emails in a timely fashion and exercising courtesy goes a long way. Outside of the foolishness, I've narrowed my options to two. In a few days, I will be departing the oppressive oven and heading for cooler temps. I initially wanted to play in Monte Carlo and the South of France but my body is tired. I'm opting for a quick trip to Toronto then off to a fitness bootcamp in the states. The medicine I take for my heart makes me tired and grumpy. It's my goal to get fit and rid myself of these toxic but necessary (for the moment) pills. and that's all with me, what's up with you. 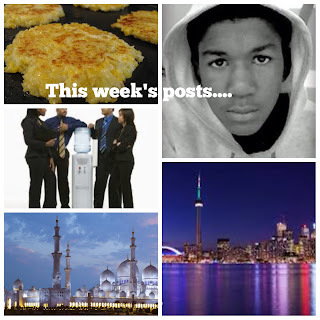 Tags: "news" "Trayvon Martin" "George Zimmerman" "Abu Dhabi heat" "Jai Stone" "essence.com" "Iftar" "Ramadan" "cauliflower hash" "teacher in Abu Dhabi"
Karma is real and it will come. I hate when people don't answer their emails in a timely fashion this is a new age where your emails should come to your phone so I know you see it smh. Glad you are settled in and the food is looking good. Girl I am about tired of direct tv and realize that comcast really is no different in price. Karma is real! Glad your move went well! Oh to travel the globe like you! Oh yeah Karma is that B. For real. I had to click over and read that article. I had to disconnect some people from my life for some of those behaviors and I couldn't be more better off for it. Sometimes you have to know when to let those people go. I love that karma rewards both the good and bad. Disconnecting from toxic people is a lifesaver. "Karma rewards the good and the bad." Love that! So true. KARMA will strike when folks least expect it!!!! !